When you are building a home or are planning to change the look of an existing bedroom, the first question that comes to mind is, how should I start. The bedroom décor can play an essential role in enhancing your mood when you walk in to the room after a tiring long day and one thing we can assure you is that a great decor would take only a few seconds to refill the energy spent during the day. 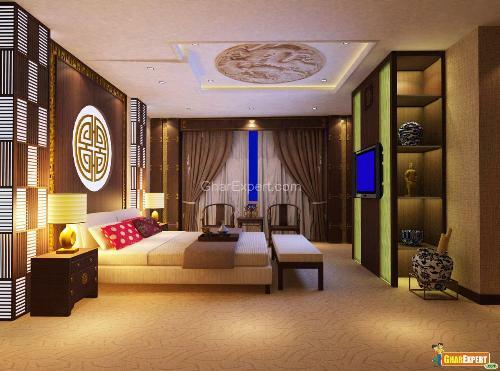 Consider the following bedroom decorating ideas if you are up for a new master bedroom. You master bedroom must reflect a serene environment; therefore, you need to put in a lot of efforts in the master bedroom décor. 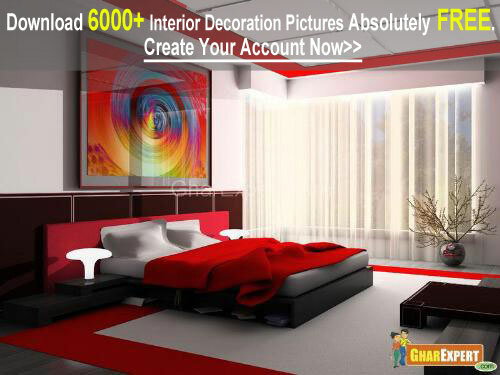 The first thing you need is to get inspiration, either from our website where we have a dedicated section of bedroom theme designs or from your imagination. Think creatively and out of the box, and then decide a theme. You pick one or two bold elements in your room and plan around those bold elements. The picture above has a very strong bed head board where as the in picture below, the pictures hung on the wall behind the bed instantly grab attention. A bedroom theme makes it look composite and pulls all the design elements together for a complete reflection of taste and style. 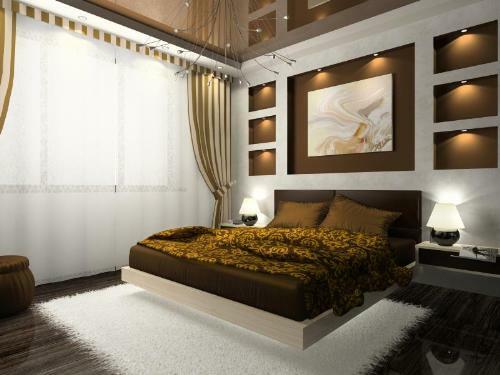 You can either choose the minimalist, romantic, natural or a bold theme for your bedroom decor. The room shown below has minimal design elements yet the color that spawns from bedroom ceiling to the wall behind the bed gives a very strong impression. A very light shade of pink would make this room very romantic. It is important to realize that every color has a different effect on our personalities and mindsets. Bedroom colors must be chosen in lieu of your taste and perception. Dark, bold colors like black and red evoke passion and create a strong ambiance in the bedroom but at the same time; they can promote nightmares and insomnia. 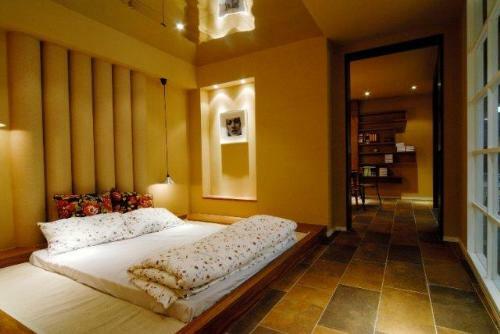 Earthy tones like browns, oranges and yellows will make a bedroom cozy but can lead to irritation and midnight snacks. Blues, greens and pinks are serene and calm colors that tend to bring tranquility and also promote restful nights. 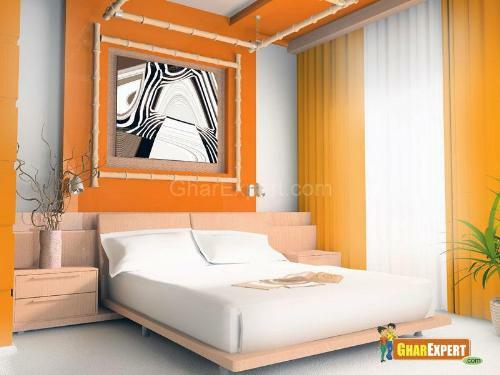 You should keep in mind your own personality and nature while deciding the bedroom paint and theme. Bedroom furniture plays an exceptional role in bedroom décor because modern designers believe that bedroom is not just a traditional sleeping place only, it’s a place where you can relax, have fun and sleep with comfort and joy. You can consider buying complete furniture sets or you can buy individual pieces of furniture for a mix and match. Generally, a bed with 2 side tables, a dresser and a wardrobe are considered bedroom furniture items but there is no hard and fast rule for this and if the room is big then you can put twin chairs with a coffee table in it too. Bedroom furniture is available in a vast range of designs and style from vintage, traditional, modern and contemporary to the ultimate chic style furniture for girls and cartoon character inspired sets for children. If you want a luxurious look in your bedroom, you can buy a loft bed and add rich fabrics to it. Use personalized wallpapers, wall decals or other bedroom accessories with various patterns and designs for a creative bedroom decoration. Consider wooden bed frames for a stately look in a large bedroom. You can even add a canopy on top of your bed and furnish it with drapes for a Royal look. Most importantly, think extra ordinarily and play around with colors to make the perfect match. Other bedroom decorating ideas may include using animal print comforters which add flare to the room. Bedspreads with stripes can add warmth and dimension to your room. Use brown and blue fabrics for comforters and bedspreads to enhance the contemporary look.